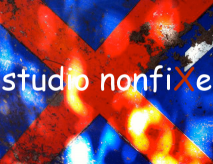 Studio nonfiXe publishes Dutch and English books. We are also involved in a number of music and film productions. Therefore you will find films and music of kindred spirited artists on this site. The publishing house can be characterized as small, activist and societally-committed, as is shown in all publications, whether these are children’s books, novels or nonfiction. We reduce our footprint by publishing mainly E-books and Print on Demand editions. The latter means that each book is printed after it is being ordered. This way we only use ink and paper for books that are actually read. Our motto: The power to differ.